Alright, so you want to know a little about the book? Well, it's got me thinking. I like that in a book. It has me thinking about things that I often think about on my own, but I like the points the author brings up and how she leads me to think in different directions than I might on my own. Michelle talks a lot about letting things go. (Sidenote: My kids are totally into the new Disney movie, Frozen, so I've been hearing a lot of belted out "Let it go! Let it go!" around my house, so every time I read "let it go" in Michelle's book, I had that song going through my head- I guess it helped cement the idea for me!) 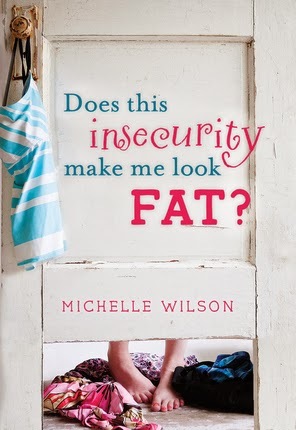 She writes about letting go of pity, a need for others' approval, fear, doubt, comparing ourselves to others, envy, guilt, & shame in order to become confident and get past insecurity. When I read the part about envy, I wrote this in my notes: "envy ruins our attitude & our gratitude", and "Opposite of Envy = Charity". When we have charity we are glad when others prosper. We love, serve, and are happy for others. Our view of them is not tied to our view of ourselves. This issue comes up in my mind a lot (and I assume I'm not the only one who deals with it). It's good to read this fun book (which is full of cute and thought provoking stories) that helps me to think through it all and put things back into perspective. You can find Does this insecurity make me look fat? (as a paperback book or ebook) on Deseret Book's webpage. You can also find Michelle online at her website and blog. You can also enter to win your own copy of the book over here and here.